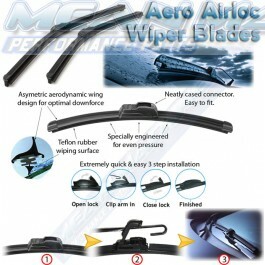 Wiper blade upgrade to Aero / Airlock frameless wiper blades. To upgrade, simply measure your wiper blades with a tape measure and select the correct length Aero wiper blades. The future of wiper blades - Aero Airloc frameless Wiper Blades. Perfect wiper performance on every point of the windscreen due to the Evolution tension strip. The aerodynamically superior frameless wiper blade design gives even pressure across the whole length of the Aero wiper blade resulting in smooth, quiet operation, less chatter and a far longer lifespan than standard metal wiper blades. The protective coating with the highest quality UV stable rubber together with a hard natural rubber double micro edge, will provide an optimally clean wipe. This flat Aero wiper blade upgrade will fit onto any wiper arm with a hook type fitting. Included is 1x 12" (29 cm) wiper blade upgrade per pack. * The anti-lift spoiler increases downforce and gives increased wiping performance. * Frameless blade, protected from the elements. Say goodbye to rusty wiper blades! * Low profile design, elegant integrated wiper blade to wiper arm connector. * Wind noise is reduced by 50% at high speeds when compared to standard wiper blades. * All weather wiper blade. Improved performance, even in snow / ice conditions. * Direct replacement. Very quick and easy upgrade to standard metal wiper blades.